The new South West Herts Community Website is now live! This post is here to explain a few of the features and to help you get around. On the left you can see the toolbar in the top section of the Website. This has a number of links... (1) What is Link4Growth? (2) The national discussion forums that link all of us involved in community building (3) The local Link4Growth events where we can all meet and have conversations (4) The community calendar which will be a fantastic resource for everything happening locally all in one place. The great news is that multiple people can given the ability to update the calendar enabling us to share the load and reach out to get all the community events (5) Training and Workshops, which links to the Link4Skills education and learning platform... all about sharing knowledge experience, expertise and helping connect those that need knowledge with those that have it! 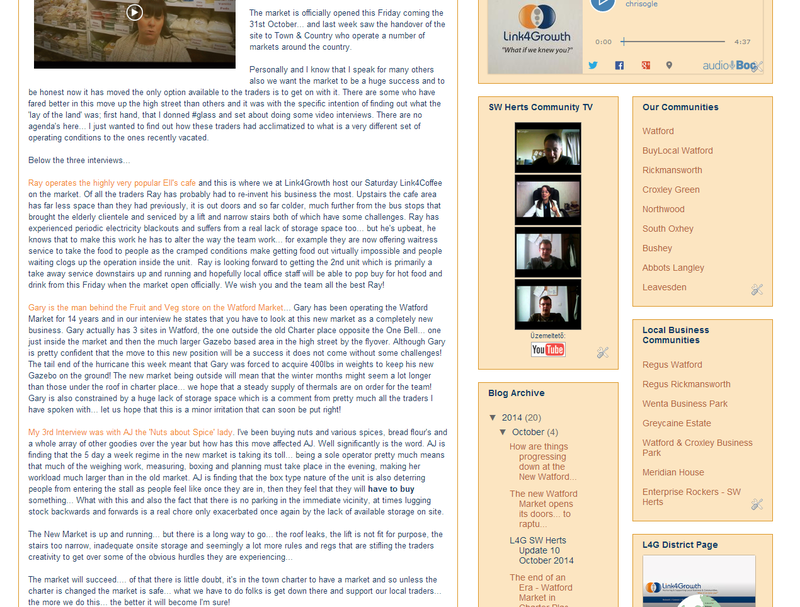 The main body of the website is where the 'Blogs' appear and like the calendar anyone that wants to write articles or content about things happening in the community can be set up as guest bloggers. 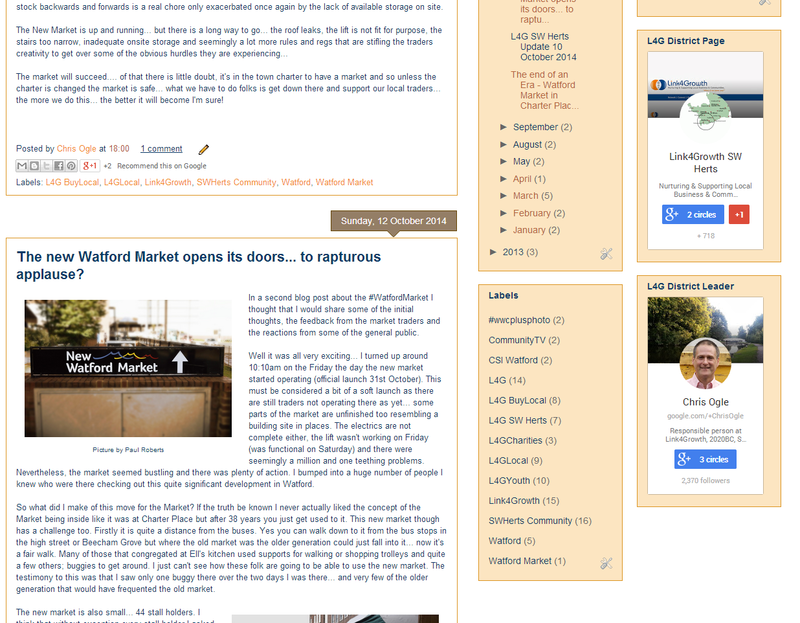 If you think local newspapers and think articles, features or reports then this is exactly what the blog can be used for... know anyone that is keen to get their information out to a wider audience locally? ... then please write it up and pass it over! ... if you know any retired journalists or copywriters that would like to get involved in local community reporting as well as demonstrate their writing skills please let them know that 'we need them' or... anyone at college looking at media or journalism and would like to get some practice in? ... these are all opportunities going to those that have their eyes open! ... lots of local people will see these posts, what better way to get yourself noticed... the faster the better! On the far right hand side we have two (it might be more later) sets of communities. These you will recognise as the towns and suburbs of the SW Herts District, and Local Business communities (business parks in Watford). There is also a BuyLocal Watford... if you know any local independent businesses get them to sort out their Business Page on G+ and join the BuyLocal community that is what it is there for!! Just click on these communities to visit them... these communities are where any of us can make the news about things going on around us, what we're interested in, all local posts by people living and / or working locally. We even run competitions such as the picture competition organised in conjunction with the Watford Women's Centre. These communities are a really easy way for you to engage with other local people around you, and also we look at these posts for content to share on the blog... and maybe do a feature on!! Please do join in and send the link to other local people you know to get them involved too! When a blog post is added we can add labels as a way of finding articles, features about specific areas... these are listed in the first of the right hand column sidebars. When we start to post about Rickmansworth or Abbots Langley these labels will be used so that you can home in on the parts which are likely to be of most interest to you. 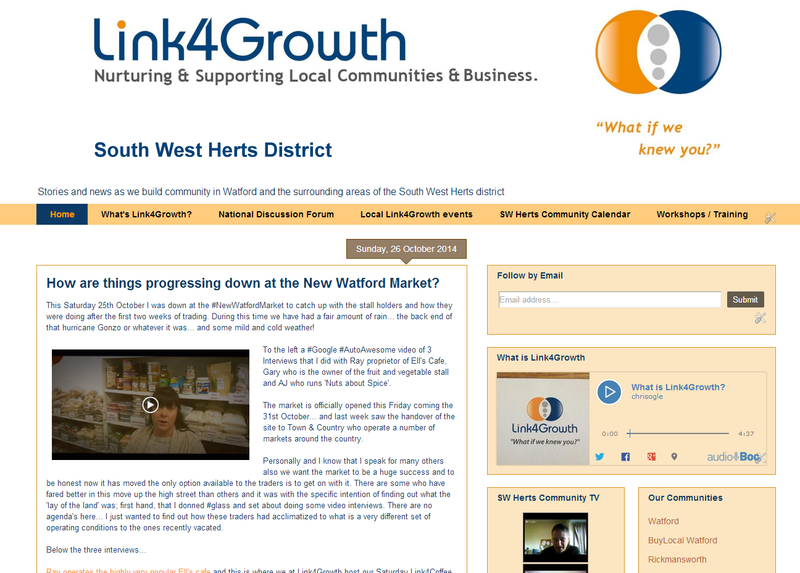 On the far right you can see a link to the SW Herts District Page... think County council... and this is kind of what the District page is about keeping you up to date with what is happening with Link4Growth across the District. Such as new coffees, new announcements and the like... so please add the District Page to your circles so you don't miss out on the news as it happens. There is also a link there to my own profile page as acting District Leader. Please do add me to your circles I will reciprocate. I think that this website for the local community will enable us to provide a really comprehensive information platform to serve the local community. It is totally free to use, ad free and the best bit, it allows any of us who want to contribute to be able to do so, easily and effectively. Please do share this website with others, I know there is a lot going on out there in the community... we now have a platform that allows us to get it out to others in the community easily and at NO COST!! ... shall we?